The Ellison Foundation is happy to announce the 2018 recipients of the EllisonEducation Grants. The foundation funded twelve grants in 2018. Mount View Elementary is a dual language (Spanish-English) immersion school that serves a highly diverse population. It’s the only elementary school in Highline Public Schools with four subject “coaches”. The coaches will attend a “Teaching and Coaching” conference to help transform how they serve their teachers. Instead of asking “how can a teacher improve their methods” they’ll be looking at student data to ask, “What does a student need from their teacher to succeed”? Shannon works with students who enter Lewis and Clark High School with little to no English Language skills. 53% of students are refugees and 98% come from “free and reduced” lunch households. His students lack the technological and cultural literacy necessary to succeed in the 21st Century classroom. Laptops will be purchased to enhance their “technological literacy” and teach students how to access the programs and tools to guide their learning. Funding is being provided to grow the robotics program at Mt. Stuart Elementary. The grant allows additional students to participate and compete in tournaments throughout Washington State. 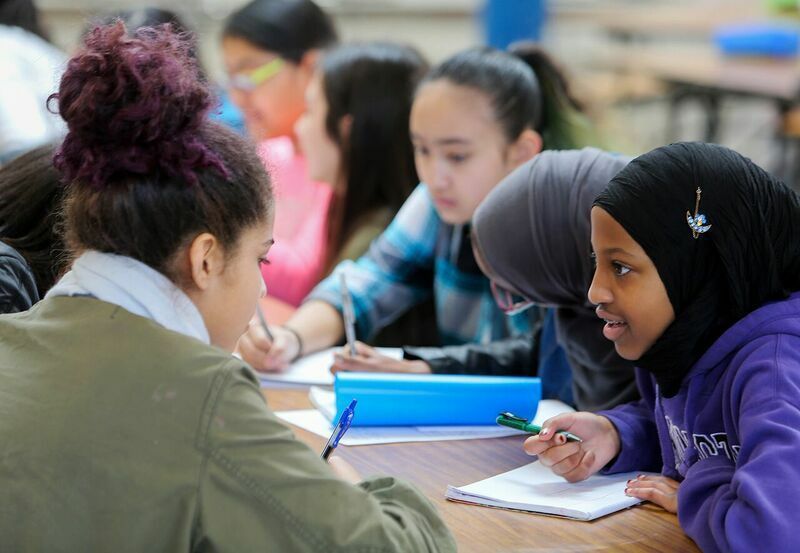 Speaking English is not a requirement to playing chess and West Seattle Elementary hopes to use chess to break down academic barriers for ELL students. West Seattle Elementary hopes to grow their “chess culture” including hosting a state “qualifying” tournament at school. To create greater engagement, collaboration and curiosity in both reading and math, Betz Elementary will purchase a “SMART Board and Learning Suite” for Melissa’s classroom. State of the art “SMART Boards” are not currently used in Cheney School District elementary classrooms. In addition to using the “SMART Board” in the classroom it will also be used as a professional development tool at Betz Elementary. The focus of the “Red Rock STEM Academy” is to develop 21st Century skills in critical thinking, problem solving, coding, programming, research and teamwork. As the schools regular schedule doesn’t include teaching STEM activities on a daily and weekly basis, the after-school program has filled the gap. The “Red Rock STEM Academy” will be offered two times a year over two twelve-week periods. Funds will be provided to purchase equipment and supplies for the two sessions. There are many students at Cle Elum – Roslyn High School who have the potential to be thoughtful and engaged readers but struggle to do so. Due to budgetary limitations the school struggles to provide enough “Common Core” recommended books that engage students at different reading and interest levels. Based on the success of two “Common Core” recommended texts in the current curriculum, additional books including subgenres of adventure stories, historical fiction, myths, mysteries, science fiction and realistic fiction will be purchased to impact students at all levels. The Renton School District does not currently have curriculum that supports learning with a “STEM” focus. Andrea and her team will purchase equipment that will allow 250 students grades 3 to 6 to participate in an engineering process that meets “Next Generation Science Standards”. The “state of the art” equipment will enhance their current equipment and challenge students at all learning levels. In addition to students, professional development will be provided for teachers and staff. Many Kindergarten students enter Evergreen Heights with little to no “formal” school experience and lack sufficient math and literacy skills. Next Fall Diana will introduce the “Learning is Alive” technology and curriculum to her classroom. The objective of “Learning Alive” is to accelerate the learning of all students as they participate in their first formal classroom. In addition to those most in need, the “Learning Alive” curriculum and technology provides teaching that is interactive and extremely engaging allowing for an increase in information retention and application for all students. Mental wellbeing affects academic performance. Students who suffer from trauma often perform poorly in school as well. Students at “Gregory Heights” struggle every day to cope with the real-life stress they bring to school. In addition to Kayla attending the “Educating Mindful Minds” conference, the grant will create and furnish a “mindfulness room” for students and staff to use in an environment created for them. Fewer than half of all public K-12 schools offer meaningful computer science courses that include programming. Funds will be used to grow their existing program focusing on designing technology rather than just “using” it. Outlook Elementary will create a school newspaper and yearbook as a strategy to engage learners in creative, relevant, and purposeful informational and opinion writing. The act of writing with a journalistic focus will allow students to work collaboratively, complete tasks with hard deadlines, understand photography concepts, utilize technology and express student voice. This project will allow students to write “outside” the classroom creating a whole school publication that informs, educates and entertains the school community.